A MUM who lost 11 stone in two years has a message for overweight people – accept the help that is available and you can shed plenty of pounds. Weighing 26½ stones, various health problems and family stresses made life difficult for Lorna Murray, from Goldsworth Park. Lorna Murray on a visit to the RHS Wisley Garden in November with her sister-in-law Sue Murray, daughter Naomi and husband Joe. She is now 15½ stone and a lot happier, after deciding she had to lose a substantial amount of weight. Lorna has succeeded through a combination of having a gastric band operation, expert dietary advice and following a personal exercise programme. “I finally realised that unless I accept the help I needed to lose the weight, I was not going to be able to do it,” said Lorna, who is 58. “I decided to stop arguing with people who cared for me and made three resolutions. Lorna, a part-time telemarketer for the Royal National Institute of Blind People (RNIB), lives with her husband Joe and daughter Naomi. 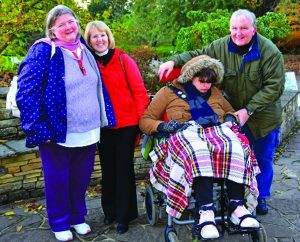 Naomi, 21, who has cerebral palsy and suffers from epilepsy, needs 24-hour care. Lorna eventually asked her GP for help. She was referred to a consultant at Frimley Park Hospital who told her she could become seriously ill if she did not lose weight. The gastric band operation, carried out at Spire Clare Park Hospital in Farnham, has been a huge help, in combination with following advice from a nutritionist and a personalised fitness programme in the gym at Lightwater Leisure Centre.